* I have completely reorganized my free pattern library, and so this pattern has been relocated to my crafter site! Sorry for the inconvenience! 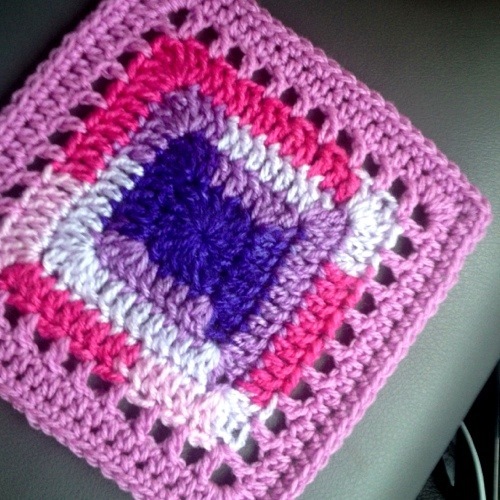 Posted in Free Patterns, PatchworkTagged Block, Crochet, Granny squareBookmark the permalink. Let me know what you think is the issue! The Solid granny? The eyelet round? The solid border? Let me know! What does Tr and Hdc mean? At beginning of round 6, something doesn’t seem quite right. Shouldn’t there be like maybe a ch 2, then hdc in next ch, then 2hdc,DC,2hdc in corner ch? I haven’t made this in a while! But you should be in the corner already, so when you make your (SC, Ch-1) that counts as the center DC for the corner. Then you work your 2HDC, go around the square, and finally work your 2HDC in the first corner to complete the 5 corner Sts. I only do it this way so you’re always ending up directly in a corner st.